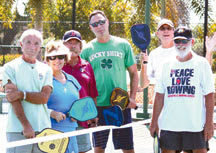 While the pickleball group at the Racquet Center has certainly grown close, they encourage anyone to come out and bring their paddle. “The beauty of this game is that pickleball players travel with their paddles. So we have a lot of visitors from other states who come in and play while they’re here,” states Rodgers.